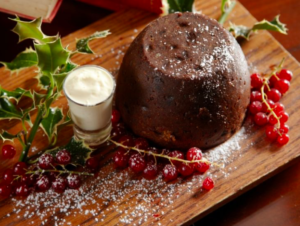 Our famous Barnabrow Christmas Puddings have been given some added punch by Chef Stuart Bowes – using his alchemy, he has distilled them with locally brewed Jameson Whiskey and soaked them with a double potion of Guinness. This is an adaptation to the recipe passed down through generations of the family at Barnabrow over the past hundred years. 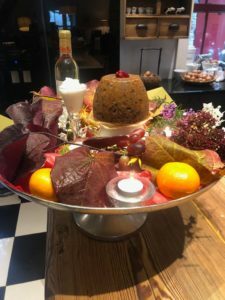 The pudding is dark, laden with fruit, bound with butter, laced with fresh spices, sprinkled with fairy dust, sweetened with local honey and carrot from our own Victorian walled garden. But the whisky and stout that moistens also pulls some punches. 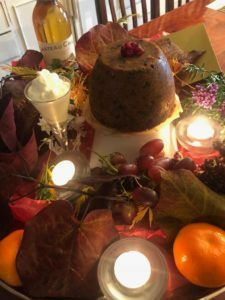 Flaming the pudding with Jameson is family ritual on Christmas morning in Barnabrow, for friends that travel with that treat in mind. The blue flames never fail to delight – both young and old – on this morning that is so full of delights. We fill the pantry with several and while they do not last long because we love them so much, they do preserve well (the booze) and we indulge on dark evenings by the fire in February. On sale in all shapes and sizes in The Roughty Fruit King stall in the English Market, at Angela’s shop Midleton, at Ina McCarthy Flowers Midleton and of course here at Barnabrow. 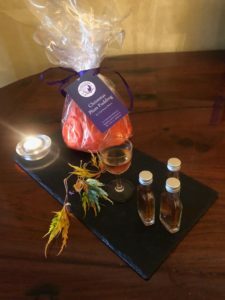 Not alone are our puddings delicious and decadent we have also filled them with a selection of Prizes and you have a a one in ten chance of winning 🙂 We like those odds!! €15 for 2lb, €10 for 1lb and €8 for 1/2lb. Limited availability so make sure to order yours today.